Leamington and their hosts produced a superb display of real quality and passionate rugby in this rearranged fixture on Friday evening. The scoreline would suggest an indifferent defensive show from both sides. However, that would be harsh. 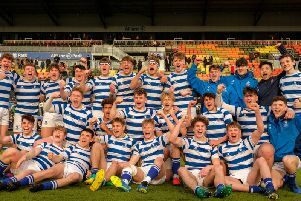 While some errors did occur to gift points, the emphasis was on some exquisitely executed football, a testament to the quality of rugby regularly served up in Midlands Two West (South). Another feature of this very entertaining match was the ferocious tackling from both camps, with neither side willing to give way. The playing surface was excellent, especially in view of recent climatic conditions, with the firm footing conducive for running rugby and an explosive start from the hosts brought early reward with an unconverted try. However, from the restart Leamington made their intentions known with an immediate and positive response. Attacking the kick-off, the visitors forced a penalty which Tom Jewitt nailed into the far corner. Working to tried and tested patterns, skipper Craig Smith took possession at the lineout and allowed his pack to set up a drive towards the line. With the home defence sucked in, Leamington prop Aled Thomas found himself with space to crash over to draw the sides level. From wide out, Jim Robertson sent over a howitzer-like conversion to put his side ahead. The hosts regained the initiative with a penalty goal, followed by a converted try and at this stage were looking very strong in attack. The Leamington squad were now getting some intense tackling practice but were up for the challenge, with Smith and John Brear putting in some huge hits to try and stem the flow. A clearance kick from Barkers’ Butts was superbly fielded by winger Kenny Kwok who then went on a mesmeric run, cutting through the home defence before being felled by a high tackle. This gave Robertson the opportunity to reduce the deficit with a coolly slotted penalty. The pace of the game was frenetic, no doubt enabling the players to ward off the effects of the dropping temperature. A further converted score from the home side put distance between the sides, although Leamington still had plenty to offer as another positive run from Kwok and a clever kick and chase from full-back Rich McKowen, nearly brought a return. Before the half came to a close, Leamington once again used a penalty offering to kick themselves into the corner and from the resulting lineout, Gareth Shuttleworth was on hand to get the all-important touchdown. Robertson’s kicking form was top-notch again, as he sent over another touchline conversion to cut the hosts’ lead to 22-17 at the break. The high tempo continued after the restart with Leamington going close courtesy of an enterprising run from winger Garrett Bell. However, the hosts were able to post two further converted scores to once again put distance between the sides. Leamington regrouped and Rich McKowen sounded the alarm bells in the home defence with a direct run and Brear was continually punching big holes in the backline with his forceful running. The breakthrough came via a pushover scrum, with Brear getting the ball over, allowing Robertson to convert. This was the start of a good passage of play for Leamington and some neat inter-passing between Robertson and Patrick Northover deep in the home 22 nearly unlocked the Barkers’ defence. Keeping up the momentum, Leamington forced several penalties, the last of which was used to kick for touch. This was the precursor for another piece of quality play from the pack as the catch and drive worked to plan with Shuttleworth, now deputising at scrum-half, claiming the try. A slender seven-point gap now separated the sides and while Leamington were looking the more likely to score, it was the hosts who made the most of a lapse in the visitors’ defence to score a vital and, ultimately, decisive try. Time was now against Leamington. However, their dogged attitude earned them another converted score with Lewis Kelsey resuming his usual role to finish off another impressive rolling maul. Robertson was on target with the conversion and the deficit now was just five points. However, Barkers’ Butts forced the final minutes of the game to be played in the Leamington half and despite several attempts, the visitors had to be content with two losing bonus points.